Still Gallery (8m 42s, HD) Selections from the film’s score play as the stills automatically play. Video Promo (7m 47s, Upscale HD, 1.33:1) Condensed version of the film sent to video stores to show what the film is. 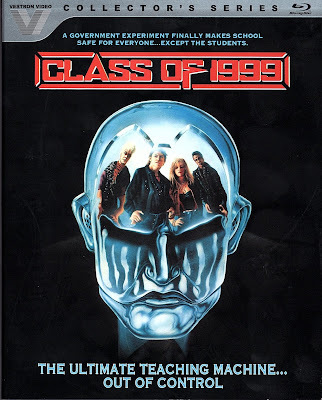 All of the interviews are new and exclusive to this release and provide a great look into the making of Class of 1999. The interview with Lester is probably the best feature here as is his commentary track. Lester is a born storyteller and this makes his interviews and commentaries much more entertaining. The interview with Joyner is really good. His viewpoint of the film and his process of writing it is fascinating. The one letdown was the interview with the special effects guys. While they do have some great stories to tell, they don’t really go into a lot when it comes to how the effects were done. This could have been because they didn’t want to give away too many secrets or it could be that the producers of the special features couldn’t fit it into the narrative they are trying tell. Who knows? All in all, I loved spending time learning about a childhood favorite. 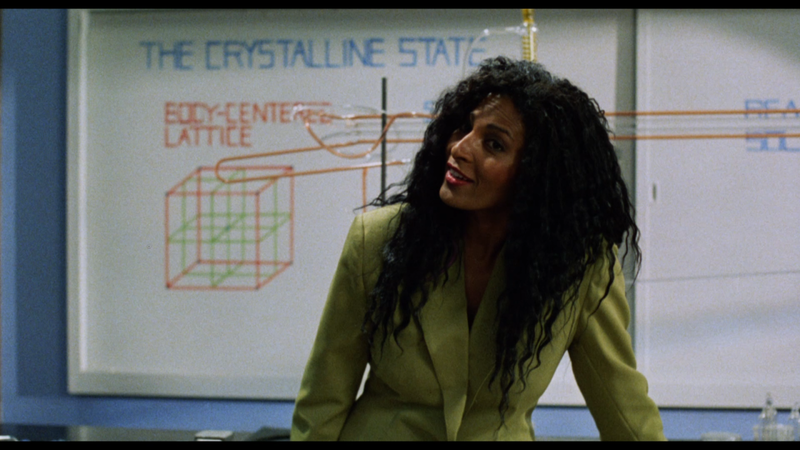 Framed in its original aspect ratio of 1.85:1, Class of 1999 looks good. The transfer used here was taken from an older master and this results in an inconsistent picture quality. There are some scenes and shots that look a bit worn, while other scenes look great. Detail is nice in close ups, but the further away the camera gets, the less detailed the picture becomes. Colors look nice as do skin tones. There is some grain throughout the film, but it is just as inconsistent as the picture quality. The sound, a 2.0 DTS-HD MA track, is pretty good. Dialogue is crisp and clean while the action scenes provide a nice kick. Everything here sounds really nice and I have no complaints. The time is the future, and youth gang violence is so high that the areas around some schools have become “free fire zones” into which not even the police will venture. 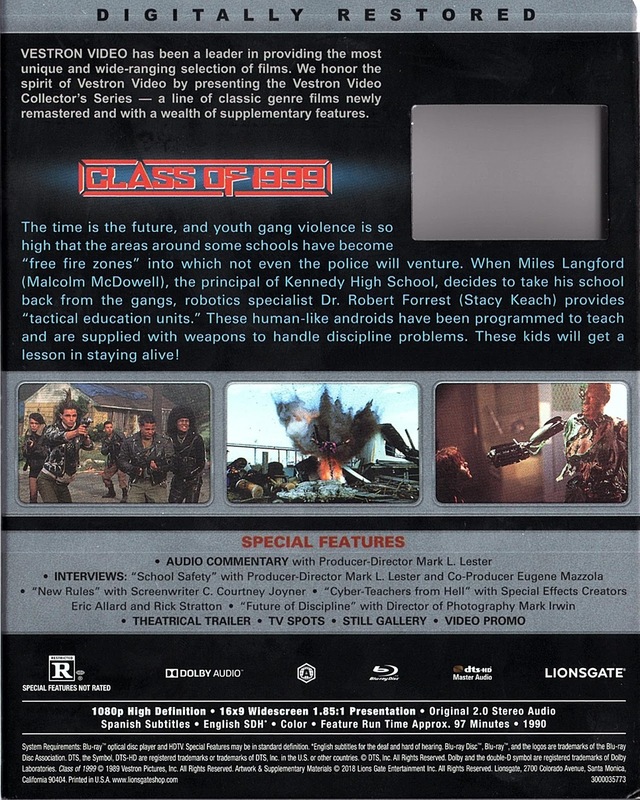 When Miles Langford (Malcolm McDowell), the principal of Kennedy High School, decides to take his school back from the gangs, robotics specialist Dr. Robert Forrest (Stacy Keach) provides “tactical education units”. These human-like androids have been programmed to teach and are supplied with weapons to handle discipline problems. These kids will get a lesson in staying alive. Class of 1999 is the best kind of sci-fi film. It takes the material serious enough to be competent but also is cheesy enough to come across too seriously. It is a delicate balancing act that many films try to do but fail. Class of 1999 does not fail. The film takes the premise of military androids being reprogrammed to teach and runs with it. Everything that you can think of these teachers doing, they do. One of the androids, played by John P. Ryan, takes two rowdy teenagers, bends them over his knee, and spanks them. This was during a time when spanking your kids didn’t get you a death sentence, but the sight of a grown man spanking teenagers who have started a fight in his classroom is funny and kind of scary. Can you imagine doing something bad enough to get a spanking in front of your entire class? That would be embarrassing, especially now with cell phones and cameras. But it goes to show how these androids approach not only teaching but discipline as well. The main teenagers, played by Bradley Gregg and Traci Lind, suspect that the teachers are not what they seem to be after one of their friends “overdoses” during school. 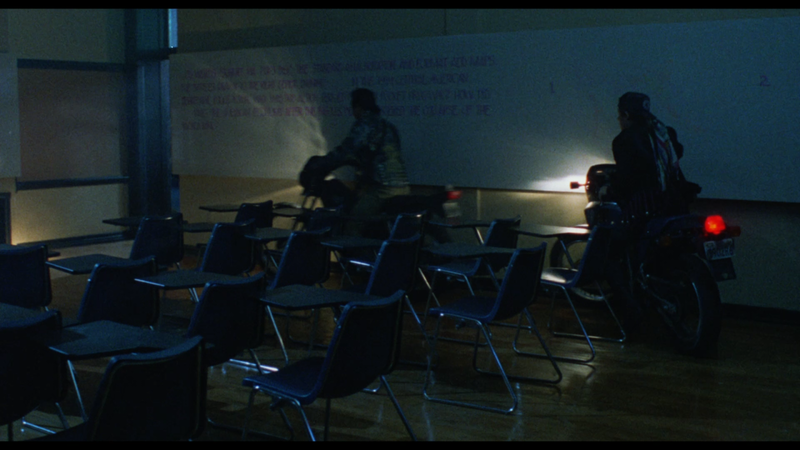 Their breaking in of the teachers home leads to one of the best chase scenes in low budget film history. Mark L. Lester knows how to frame his action and calls on the services of Paul Baxley, who is part of the Baxley family who are world class stunt people, to stage the chase, which is exciting and thrilling. I wish that we would get more action scenes like this one, but I don’t see that changing anytime soon. 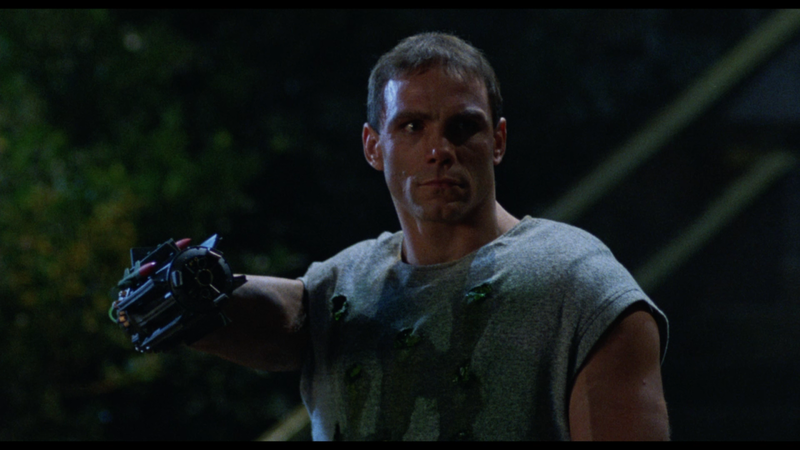 Lester is known for his action films, having helmed one of my favorite action films of all time, Commando with Arnold Schwarzenegger. He likes to have fun with his action scenes and it shows. The way he stages his action scene, especially on a low budget, is impressive and he gets the most out of his actors and stunt crew. How many times are you going to see Pam Grier, with a flamethrower for an arm, chasing after students, all the while not looking scared out of her mind that her hair is going to catch fire? Also, with this film being worked on by the Baxley family, you know that you will see some great explosions and this film has many of them and they are all impressive. 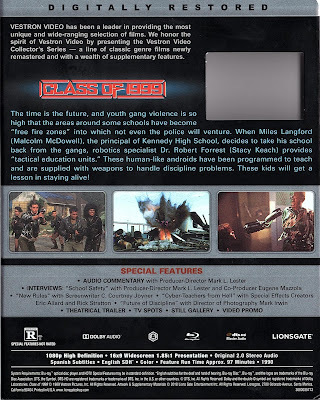 Class of 1999 was a film that I owned on many different formats throughout the years. I owned a VHS copy, a DVD copy, and now this blu-ray. I really like Class of 1999. I think that the film is entertaining as hell, but also made with a lot of love and care. The filmmakers know what they are presenting is ludacris, so they have their tongue firmly planted in their cheeks. The result is a film that can be entertaining on many different levels. Some think it is cheesy, while others find it to be a good time at the movies. I think the latter, but that doesn’t mean we can’t enjoy the film together. The blu-ray, from Lionsgate through their Vestron Video Collector’s Series line, is pretty good. While the picture quality could have been better, the sound is really good as are the special features. This is a must own for those who can’t enough of 80’s and 90’s cult films as well as those who want to find a solid action film for their movie night.